Star King is the first of a series of SF novels detailing Kirth Gersen's pursuit of the Demon Princes. The Princes are a group of interplanetary gangsters that wiped out Gersen's family in a brutal slave raid. Now Gersen is a grown man, and has been raised by his grandfather to be the ultimate man-hunter: an expert engineer (the better to devise weapons against his foes), a scholar of interstellar culture (the better to understand the myriad worlds the Demon Princes operate in), and a stone killer (do you need an explanation?). The action begins in "The Beyond," a lawless frontier zone outside of the Oikumene, mankind's interstellar empire. Gersen meets a prospector who has found a planet too beautiful to report to his patron for exploitation. When the patron in question turns out to be Attel Malagate the Woe, one of the Demon Princes, Gersen is on it like a pitbull on a steak. Malagate is a "Star King," an alien race that has developed the ability to blend in so well that they are more-or-less indistinguishable from humans. All Gersen has to do is get past Malagate's hired killers and figure out who the Star King really is. While Malagate the Woe remains in the background, Vance sketches his henchmen deftly: Suthiro the Venefice who worships Godogma, the god of destiny who carries a flower and whip and walks on wheels, and "Fancy" Dasc, a gangster who was brutally mutilated by a rival, and who takes horrific revenge in turn. Star King is good, old-fashioned space opera of the kind that set a pattern for good NEW space opera. 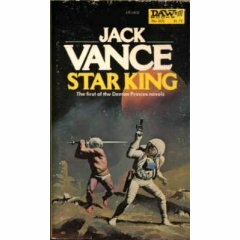 Vance's contribution to SF was the ability to create characters and settings that let the genre do what it was meant to do, give the reader a sense of wonder. 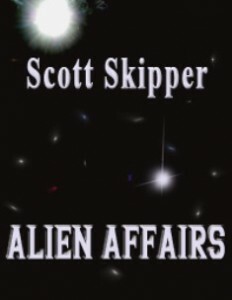 I would have added to this review Jack Vance's ridiculous need to us a four or five syllable word where a one syllable word would suffice. He really likes to obfuscate the point. Other than that, completely agree.